Join a fossil hunt on the Jurassic Coast in Dorset. As you explore a stretch of beach between Charmouth and Lyme Regis, get tips on what fossils to look out for. Britain's rocks hold a fascinating record of the country's prehistoric past, ready for you to unearth. It's a fun challenge to search for fossils and identify what and how old they are. In the 360° video above, Alison Ferris, a warden at Charmouth Heritage Coast Centre, takes a group of students fossil collecting on the beach by Black Ven cliff, where there are lots of treasures to find from the Jurassic Period. Mary Anning found many of her amazing fossils of marine creatures here. So you want to be a fossil hunter? A good way to get started is to go on a guided fossil walk. Charmouth Heritage Coast Centre and Lyme Regis Museum both run them regularly. You can find out more about fossil collecting along the Jurassic Coast - how to do it safely and responsibly - on the Jurassic Coast Trust website. 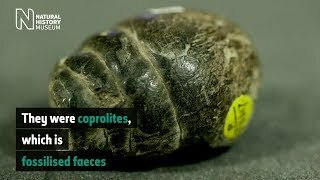 Have you found a fossil you can't identify? Try the Museum's fossil identification forum or contact our Identification and Advisory Service. Uncover the ancient plants and animals hidden beneath your feet. Enjoy talks, walks and fun activities for the whole family at this annual event.